Why Are Fillings in Baby Teeth Necessary? Many parents are shocked when they hear that their child has tooth decay or cavities and the dentist recommends treatment. Parents often ask, “Why are fillings in baby teeth (or other treatment) necessary?” and “Aren’t those baby teeth going to fall out anyways?” The short answer is yes, treatment is typically necessary, and yes those baby teeth will eventually fall out. However, we are going to explain to you why the answer to both of these questions is “yes” in this article. Why Do Cavities Need Treatment? Cavities, also called dental caries, are the most common infectious disease in children. Cavities are five times more common than asthma, 7 times more common than hay fever, and 20 times more common than diabetes. According to the Centers for Disease Control, 38% of children ages 2-11 have cavities on their baby teeth. 21% of children ages 6-11 have cavities on their permanent teeth. By adolescence, 58% of children will have had a cavity on their permanent teeth. And unfortunately, these numbers are getting larger and not smaller. So much so that untreated cavities in children is being called an epidemic. Cavities are a chronic, and transmissible infectious disease. Bacteria in the mouth that produce acid when exposed to sugars cause cavities. This acid, when allowed to stay on the teeth, eventually causes holes in the enamel and dentin of the tooth. When cavities are small and only affecting the enamel, they may be healed by remineralization. This requires fluoride treatments and diet changes that avoid baby teeth fillings. However, the cavity must be caught early because enamel, especially on the front teeth is very thin. Once the cavity has gone beyond this, it will continue to get larger until treated. What Can Be Done To Fix Cavities in Baby Teeth? Crowns – crowns for primary teeth are premade in common sizes for kids and are very different from those that adults receive. This saves tremendously on the cost, as you do not wish to spend thousands of dollars on a tooth that will eventually fall out. 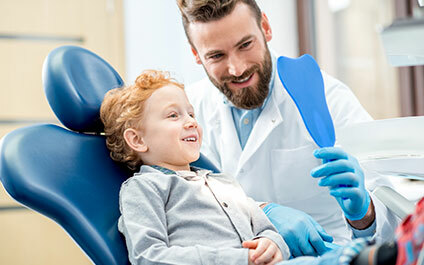 Pulpotomies – If your child is having pain, but the tooth can still be saved, a pulpotomy is performed with the crown. Although this is commonly called a “baby root canal”, just like crowns, they are very different from adult treatment. Extractions – sometimes cavities are just too big for the tooth to be salvaged, or the tooth will be lost soon anyway, and therefore it may just be extracted. You can learn more about fillings in baby teeth and crowns on Our Services Page. But Won’t Those Teeth Just Fall Out? Yes, those primary or baby teeth will fall out eventually. Primary teeth exfoliate between the ages of 6 and 13. So some of these teeth will still be around for several years and the problem is that cavities in baby teeth often progress very quickly. However, if the cavity is on a tooth that will soon fall out, we will either recommend leaving the tooth alone if the cavity is not going to cause problems or taking that tooth out early, not wasting time and money on it. And most importantly, to prevent life threatening infections and spread of infection to the brain, sinuses, ears, face, neck, and heart.